The 5th and 6th centuries were very challenging for the people of what we now know as Italy. The Roman Empire was crumbling and the institutions and communal practices that people counted on were unstable, to say the least. One window we have into the chaos and confusion that many experienced at that time is the practice of some of the Christian monks of that era, those known as the gyrovagues. As their name implies, they were wanderers, ever searching for a better, safer, more robust community to practice with. A monastery, say, that had better food, or a kinder abbot, or a more cohesive community. And yet, in the midst of that environment emerged a very different pattern of life, discerned and practiced by a monk named Benedict, from the town of Norcia (or Nursia) in Umbria, or central Italy. What Benedict (now St. Benedict, patron saint of cavers, students, Europe, and nettle stings) realized was that one of the essential practices of Christianity is to trust that God is not elsewhere. And over time he created a way to live this out, eventually formalized into a Rule for those who lived in Christian community with him. And out of this way of living came a way to understand the Christian practice as a cycle of sorts––that of Stability, Obedience, and Conversion of Life. In time this reliable pattern came be known as the Benedictine Life Cycle. This past weekend, our new Vestry used this lens to look at the communal life of All Souls Parish in Berkeley. The retreat plan is one of three that a colleague and I have been working on, thanks to the mini-sabbatical I was offered by All Souls this past fall. The hope behind the retreat plan is that by holding up a congregation’s practices of sustaining balance (which is stability, not statis), and paying attention to the ways that we listen (the heart of obedience), and the times that we have been open to new life (which conversion offers), righteous path to follow can emerge, and areas of energy and vitality can be explored. As part of the retreat then, we talked about times in our own lives of faith when we have made changes, looked at past changes made in this congregation, and engaged scriptural witness to transformation: young Samuel’s call, Mary meeting Jesus in the Garden, and Peter’s vision in Joppa. It was as the retreat unfolded, that a truth distilled for me about Benedict’s discernment 1500 years ago – that trust in God fundamentally undergirds the transformation we seek. It’s trust in God that there will be something for us to hear that allows us to listen. It’s trust in God that new life is indeed on the horizon, that encourages us to open our hearts. And it’s trust that we can inhabit a new life way of being that has us seek out practices to help keep us in balance. While the gyrovagues per se are no longer with us, the temptation that they often followed continues to lure us, that happiness or fulfillment or worth is just around the next corner, with a new job, new partner, new car, new season on Netflix, new iPhone, or new church. In a culture that seems essentially geared to the grass being greener on the other side of the fence, it’s the wisdom of St. Benedict that continues to remind us all that, in fact, God is not elsewhere. For this I am phenomenally grateful. I walk into a quiet, empty room. Things are peaceful… for now. Preparations must be made, though, for the small community that will be gathered here in [checking the clock] twenty minutes. Is the story in order? Do we have enough crackers? Cups. Water. Napkins. Double check the story pieces. Review the story… do I have it right? Yes, of course… I know this one. It’s my favorite. I’m rushing around and double checking things so that I won’t have to rush around once we’re gathered. Another minister arrives. In the ancient liturgy there was an ostiarius, “door person.” We’ve retained the office, but the duties have shifted a bit. Our door person’s job is not to keep people out but rather to welcome them in. We chat a bit, and then the welcoming begins. Quietly, calmly, I tell the story of Abram and Sarai, who went on a journey and changed their names. The box of sand is the desert, and soon the rivers Tigris and Euphrates are running through it. The great city Ur of the Chaldees rises, and these two people make their journey together, trusting in God’s promise. After a long life filled with hardship, sorrow, faith, and unexpected joy, they are buried at Mamre, near the oak trees – first Sarah, and then her husband Abraham. But that isn’t the end of the story. Their most unexpected joy was a child they named Laughter. This boy Isaac (as he was called in their language) married Rachel, and they had children, Esau and Jacob. Between the two of them and their several wives, they had 18 more children. And their children had children. And their children had children. And their children had children. Some people were born into the family. Some were adopted. Some came through marriage. Some asked to join, and were welcomed in. The family grew, and grew. And now we are here, members of this great family. The story told, each person has an opportunity to think, to wonder, and to respond. I wonder where they saw themselves. I wonder if there was anything they liked best. I wonder about many things, and I hope the others are wondering as well. After this, the gathering turns to ecstatic prayer and embodied meditation, which takes as many forms as there are worshippers. One flings bright rainbow colors onto paper, into the air, onto their hands, their clothes, their face. Another meticulously kneads dough into tiny, mysterious shapes. Another cuts paper in half, then half again, then half again. I wonder what they are all doing, but I keep this wondering to myself. Asking the questions I want to ask would only interrupt their spiritual exercises, so I simply ponder all these things in my heart. At the appointed time, the circle forms again and we share a modest meal together. It’s just crackers and water, but it is a feast, because we are all here together. Our time together over, the gathering disperses one by one until the room is quiet and empty again… until next week. This gathering is called Godly Play, and it happens downstairs, nearly every Sunday, at 10:10 AM. Children aged three through third grade are welcome to hear the stories, wonder together, and share a feast. Those who once were children are invited to become Door People and Story Tellers. Come find your favorite story. I moved from southern California to Berkeley in 1973 to attend CAL. That first week I walked down Bancroft Avenue and found St. Mark’s Church; it became my spiritual home for the next 20 years. The first person who introduced herself to me there was Gloria Bayne – one day she asked me if I would make some cole slaw for a new-comers’ meeting, and that was the beginning of my long involvement in the parish, and the beginning of a long and wonderful friendship with Gloria! In the following years I took part in many activities at St. Mark’s, including the Sunday evening Prayer Group, the Welcoming Committee, and most importantly, the World Mission Committee. During the early 1980’s the World Mission Committee focused on helping refugees who were fleeing the civil war in El Salvador; we visited some in prison waiting to be deported, helped some find jobs, legal aid, housing, and medical care. We protested our government’s involvement in the war. In 1985 I met my husband Tom, who came to live across the street from me on Hawthorne Terrace while working on his master’s degree at CAL. We were married a year later and he became an active member of St. Mark’s as well. Eventually we moved to Alameda in 1996, and began attending Christ Church, which became my spiritual home for the next 20 years. In addition to raising our two children, Anna and David at Christ Church, we both felt inspired to become leaders in the parish. Over time we both served on Vestry; I served as interim Church School Director for two years, led Vacation Bible School, and was very active on the Outreach Commission. In 2009 I organized and led the first of five service trips to build schools in El Salvador, sponsored by the Outreach Commission. Every year or two I hosted a parish-wide Salvadoran dinner to raise money for our trips. Our lives were transformed by our experiences there; we received much more than we gave. After many years and changes at Christ Church, Tom and my spirits became restless, and we felt anxious to search for a new church home. For two years we visited various Episcopal churches in the East Bay, stayed at one for a while and then decided it wasn’t right for us. Finally, Tom decided to join his parents’ South Indian Orthodox church in San Leandro. He rides his bike there from Alameda on Sunday mornings and has joined their equivalent of the Vestry. Luckily for me, I mentioned my spiritual search to Gloria one day last year, and she suggested “Why don’t you visit All Souls?” I did, and I was smitten! I knew the first day I came that this was the right place for me. I give thanks to everyone who has made me feel so welcome, and to the wonderful staff who do so much to make this a vibrant and soul-full house of worship and community. And I look forward to becoming an active member of the All Souls family. We, at Congregation Beth El, would like to invite members of your church to participate in this year’s interfaith Havdalah event on Saturday March 2nd at 6:00pm. After the short service, the participants are invited to a vegetarian dinner at the homes of Beth El congregants. This event has proved to be a delightful annual gathering for all of us. Everyone is welcome including children. The general idea is that we gather together at Beth El to celebrate Havdalah followed by dinner. We hope that many of you will come. 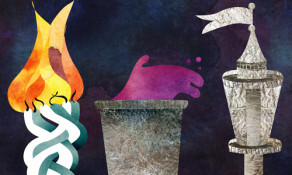 Havdalah is a Jewish ceremony marking the end of the Sabbath. It ushers in the new week, and its rituals include lighting a special candle with several wicks, saying blessings, smelling sweet spices and singing songs. This year the service, which will start at 6:00 pm will be led by cantor Elaya in our social hall. Please use this eventbrite link to sign up and participate, and also make sure to fill out the Google Form linked on the eventbrite page to be matched with a host. Camp All Souls – Save the Date! This summer we are bringing back Camp All Souls, a week-long day camp for kids to adventure, connect, explore, learn, play, create, question and more, all right here at All Souls. This year the camp will be August 12 – 16. It runs from 9:00 am to 3:00 pm and is for kids ages 5 to 11, who have completed kindergarten through fifth grade. Cost is $150, and scholarships are available. Once again, we will be welcoming middle and high school students to help lead the week, as well as adults who want to pitch in – it is a whole community affair! Stay tuned for more details and registration opening soon. – Summer Camp registration is now open! Visit diocal.org/summer-camps for the list of the 2019 programs. – Save the date for the 2019 Confirmation services: May 4 (EcoConfirmation), June 1 (General Confirmation at Grace Cathedral), November 4 (Fall Confirmation at Grace Cathedral). For more details, go to diocal.org/confirmation.